19 year ago, on March 1, 1998, the Davidson College men’s basketball team won the Southern Conference Tournament and received their first NCAA bid in twelve years. 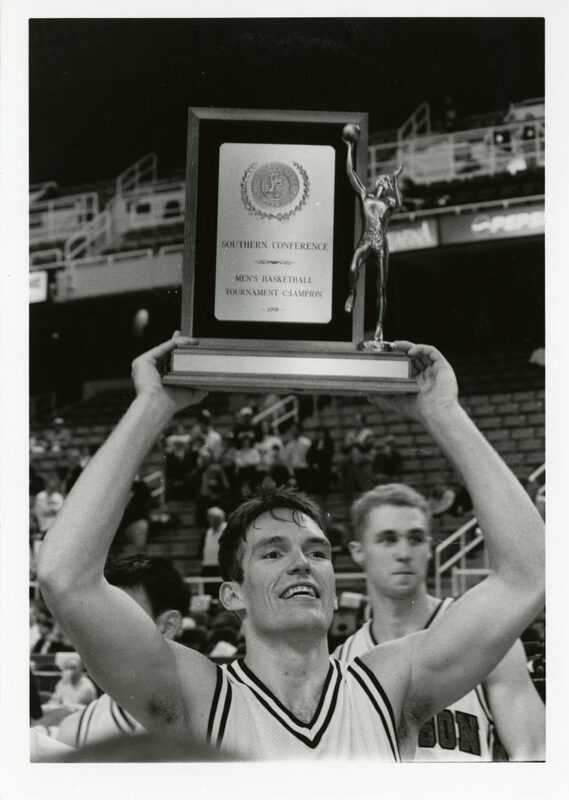 As the following season’s programs put it, “Davidson added the one achievement missing from an otherwise successful run through the ’90s.” This Southern Conference win also marked the first NCAA bid under Bob McKillop, head coach of the men’s basketball team since 1989. 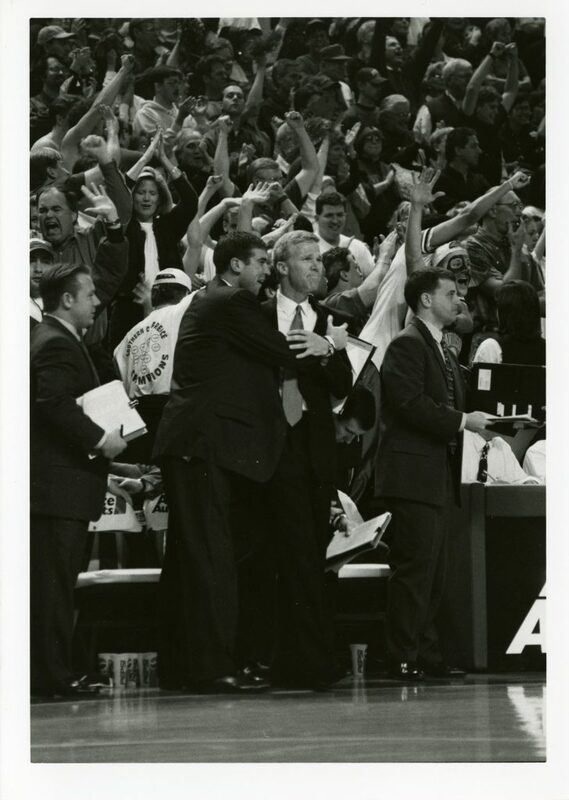 As March Madness approaches, this week’s post provides a peek into that exciting Southern Conference win, 19 years ago today. Davidson’s coaches celebrate the win. From left to right: administrative assistant Sean Sosnowski, Assistant Coach Jason Zimmerman, Head Coach Bob McKillop, Assistant Coach Steve Shurina, Assistant Coach Matt Matheny. Davidson faced off against Appalachian State at the Greensboro Coliseum for the title game on the 1st, after defeating The Citadel in a semifinal game on February 28th. The 1998 tournament marked the third appearance of the Wildcats in the SoCon final in five years, but the team had ended up on the losing side of the bracket in their previous trips. The Davidsonian ran a story detailing the Davidson men’s squad’s win over App State in the March 17, 1998 issue. “Attention all college basketball fans, casual or die-hard: Davidson College. Take Note. It’s in Davidson, N.C., which is about 15 miles north of Charlotte. It’s the eight-ranked liberal arts college in the country according to the most recent U.S. News and World Report, Due to an exceptionally large freshman class this year, enrollment is slightly over 1,600 students. Fifth-year senior Mark Donnelly holds the 1998 SoCon trophy aloft. Donnelly scored 13 points in the final game against Appalachian. While the moment of glory was brief – Davidson entered that year’s NCAA tournament as a #14 seed in the South Regional, and fell in the first round against #3 Michigan, 80-61 – this trip to the championship marked the men’s basketball team’s emergence as the small school with a lot of heart. Bob McKillop’s teams would return to the dance in 2002, 2006, 2007, 2008, 2012, 2013, and 2015. 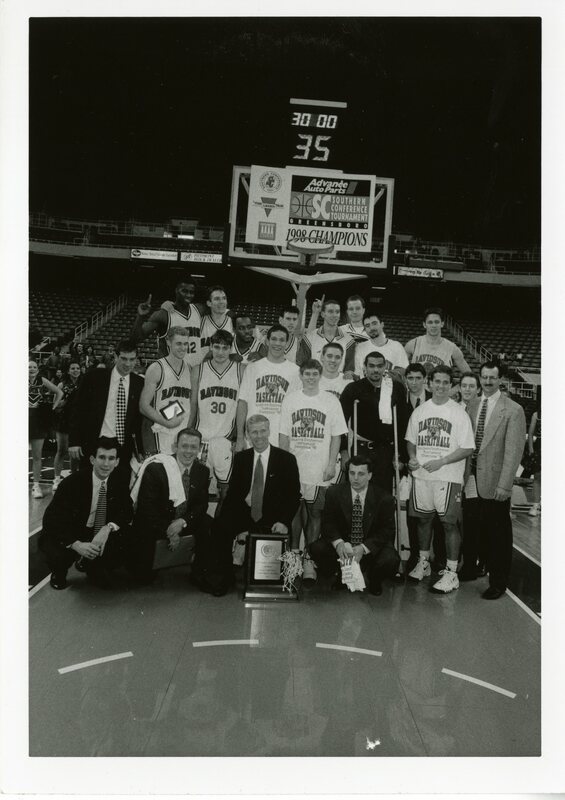 Team picture of the 1998 men’s basketball team after winning the Southern Conference Tournament. This year’s team played their final home game of the season last night (a win over St. Bonaventure), and have one more away game before heading to the Atlantic 10 Championship next week. Let’s wish the Wildcats luck!